With pastel and sorbet hues overtaking the runways and stores, its only a matter of time before you've got every colour in your growing wardrobe. Finally adding a little soft colour to our mainly monochrome wardrobes, it was great to see that Trade Secret had also embraced this trend and gives us a chance to own it at a fraction of the cost. Being such a fan of this beautifully feminine colour palette, I was more than happy to create an outfit from their wonderfully curated Spencer St store selection in Melbourne, but out in all stores now. Cosy cropped knits, classic clutches, perforated lace and longer hemlines...it's all about taking a highly anticipated step back to the demure! seriously, this is one of my fave looks from you girl! I love that shade of purple, so enchanting! And it is fresh paired with the white skirt! 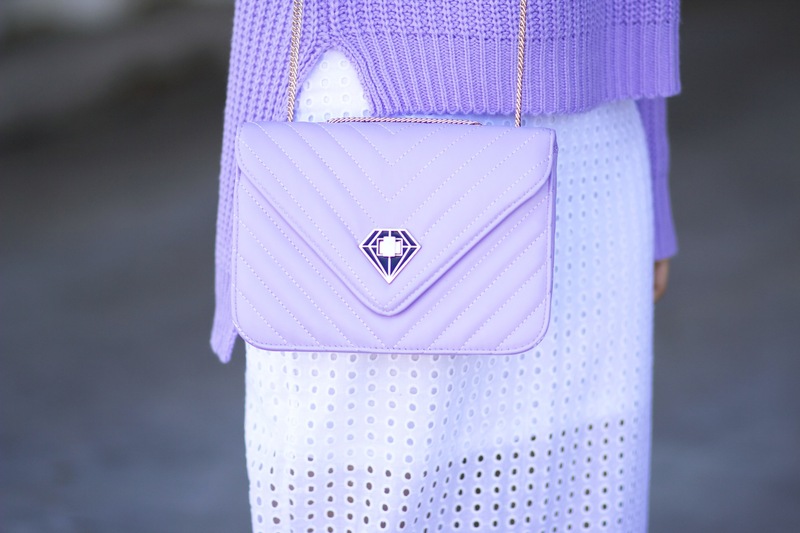 That bag is also super cool, love the diamond detail!